Author Bernardine Bishop has been posthumously included on the short list in the novel category of the Costa Award for writers based in the UK and Ireland. Bishop, who wrote Unexpected Lessons in Love after becoming sick, died in July. 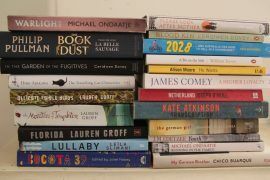 Also shortlisted for the Costa was Maggie O’Farrell for Instructions for a Heatwave, Evie Wyld for All the Birds, Singing, and Kate Atkinson’s Life After Life. are on the shortlist for the Costa Award for fiction. Among others nominated for awards in one of the four other categories were Clive James, shortlisted for the Poetry Award for Dante The Divine Comedy and Lucy Hughes-Hallett whose book The Pike: Gabriele D’Annunzio, Poet, Seducer and Preacher of War, was last month awarded the Samuel Johnson prize for non-fiction. Winners of each section will be announced in January. Each of the category winners is then in the running for the overall, Book of the Year, prize.